Purpose: To be a visible force demonstrating the vital link between Chamber businesses and the community. Programs include: ribbon cuttings, business visitations, Networking Before Hours, Employee of the Month, distribution of promotional materials and special event assistance. Ambassadors work to further the mission of the Chamber by assisting other committees and by spreading goodwill throughout the membership and community. Purpose: To develop and implement programs to retain and support existing businesses in the Hibbing Area. Goals: develop a marketing package; work with the entrepreneur fund by connecting them to businesses and the community and lending support when needed; respond to closures and businesses in trouble or distress; respond to businesses wanting to expand or open here; grant development; develop workshops or training programs for small businesses, entrepreneurs and startups; do 15 to 20 Grow Minnesota visits a year; work with the City of Hibbing on the Comp Plan; and work with the HEDA representative on retention and development projects. Purpose: To create, produce, and support a successful Small Business Saturday the last Saturday in November. Purpose: To encourage young professionals to network and connect through high quality meetings, events and gatherings. Connect helps young professionals connect to one another through meetings, lunch and learns, speed networking, Oktoberfest, Trivia Night and other events. Connect brings young professionals together from many businesses to build relationships. Purpose: To design and implement new initiatives that improve the vitality and attractiveness of downtown. Projects this year have included grant writing, pocket park development, and art wraps on utility boxes. Purpose: To oversee the financial transactions of the Chamber and to make recommendations to the Board of Directors for approval. Purpose: To be the business community’s proactive voice on government issues; a communication facilitator that informs our membership and community on legislative, regulatory and other government issues; offers position recommendations to our Board of Directors. Each fall the Committee researches upcoming legislative issues and presents them to the Chamber Board for consideration. The committee monitors legislative activity through the Minnesota Chamber and media and informs and advocates for the membership on emerging issues. On the local level the committee also monitors public issues, and advocates and informs local government on member and community interests and concerns. The committee also holds multiple candidate forums each year. Purpose: To build, through a well-developed program, a network of leaders who will actively engage in Chamber and Community projects. The Chamber has held a leadership class each year since 1996. Students participate in 6 half-day sessions on community leadership, personal and professional development. They also have one full day session at the State Capitol in March. Students will graduate in June better prepared to tackle the responsibilities of community involvement & professional leadership. Each year a new group will be enrolled in the program. 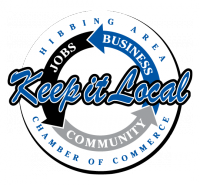 Purpose: To create and oversee the strategic marketing plan to promote the Hibbing Area Chamber of Commerce. Purpose: To assist staff and Board of Directors on matters concerning membership sales and retention. Goals: work on retaining members and recruiting new members; work on membership marketing materials; and do membership event planning. This committee is in development. Its goal is to create a high quality art and music festival to be held July 20th and 21st 2019. Purpose: To continue to provide a series of networking and special events for members and the community in an effort to enhance the business climate, fundraise for Chamber programming and create community goodwill. Starting with the Annual Dinner, the Chamber’s events continue on with the Annual Golf Outing, the Pajama Party, the Chamber Funspiel and Raffle, Hibbing Jubilee, and Small Business Saturday.